MINNIE MOUSE Stars & Smiles Walker is rated 4.8 out of 5 by 33. Is there anything sweeter than smooches from Minnie Mouse? This Disney Baby walker is made of hugs and kisses and Xs and Os. 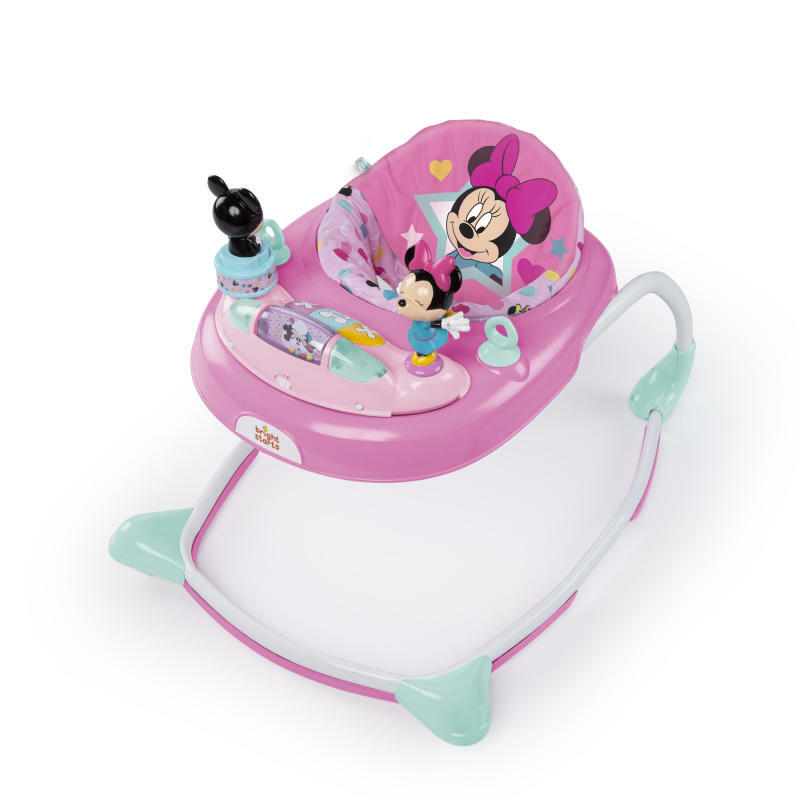 Before your baby can walk on her own, Minnie Mouse and Mickey Mouse give all the support she needs with a sturdy frame and cheerleading smiles. The removable activity center, created by Bright Starts, is packed full of Minnie’s magical fun with musical piano keys, a squeaker toy and spinning roller ball. Mom and dad can relax knowing this walker is made with safety in mind. The frame is sturdy and enhanced with rubber feet that “brake.” And the walker is sure to fit your baby juuuuuust right with 3 height positions. Blow kisses to Minnie Mouse while walking! Dimension (in) 31" x 21.5" x 24"
Seat pad – Machine wash with cold water, gentle cycle. No bleach. Tumble dry, low heat.Plastic Parts – Wipe clean with damp cloth and mild soap. Air dry. Do not immerse in water.Frame – Wipe the metal frame with soft, clean cloth and mild soap. Rated 4 out of 5 by Reelgrl from Good place to sit & play My 7 month old daughter enjoys her walker. While she isn't yet interested in walking around with it, she's happy to be sitting in the seat playing with the built in toys. My only complaint is that the mechanism for changing the height of the seat is difficult to adjust. But once you have it set where you want it, it is sturdy and solid. Rated 4 out of 5 by Kelly19 from Adorable walker Minnie mouse is a classic that everyone loves. I have been using this walker for about 3 months and it has worked well as my little one has grown to really get around in it. I like that the wheels aren't exposed so they dont tempt the baby to play with them. The seat is easy to clean but it is a little difficult to clean the toy that rolls in the front. Overall my child loves it because she can get around easily. Rated 5 out of 5 by Beautycole from So cute! Easy to put together, bright colors, and Minnie toys make this walker a winner. Are little one is learning for Quickly. Rated 4 out of 5 by BloggingMama from Cuteness all around! Do you love Minnie Mouse? If so, I think you’ll really love the Stars & Smiles Walker. Bright, girly colors, and sweet designs. This adorable walker is adjustable and also easy to put together. I like the rubber “brakes” for added support and safety. Being that the seat cushion can be removed and easily machine washable is also a plus. Apart from really not being able to take the “detachable” Minnie & Mickey toy station off that easily like I originally thought, and the adjustable noise levels not really varying in how loud they are, this is a nice little walker. Rated 4 out of 5 by BloggingMama from Cuteness all around! Do you love Minnie Mouse? If so, I think you'll really love the Stars & Smiles Walker. Bright, girly colors, and sweet designs. This adorable walker is adjustable and also easy to put together. I like the rubber "brakes" for added support and safety. Being that the seat cushion can be removed and easily machine washable is also a plus. Apart from really not being able to take the "detachable" Minnie & Mickey toy station off that easily like I originally thought, and the adjustable noise levels not really varying in how loud they are, this is a nice little walker. Rated 5 out of 5 by Th33th33 from Useful This walker is so pretty and cute. My baby loved it and it helped her a lot in learning how to walk. The colors are so cute. And the quality is amazing. I like all disney baby collection because they care a lot for details . I definitely recommend this product. Rated 5 out of 5 by Tracey1361 from She's Mobile !!!!!!!! Not only does the color catch her eye, all the added toys give her entertainment that she just can't get while playing on the floor. She really enjoys being able to follow me around the house in her mobile ride. The walker will grow with her as it has three adjustable settings for height. It easily disassembles for storage or travel. Super easy to clean, just wipe down with a disinfecting wipe and throw the material in the washer when needed. It's a hit in our house. I know it will be in yours, too!